As mining projects respond to increasingly tight environmental operating constraints, having an engineering system which allows ores to be processed in a clean and sustainable way can be key to a project’s success. Brisbane-based minerals processing group Core Resources has taken that idea as a challenge to push to the forefront of sustainable metallurgical development and provide its clients with the opportunity to effectively valorise ore bodies while minimising the contained harmful by-products. Orebodies around the world are becoming more complex with greater regulatory constraints on processing. Coupled with the current attention on energy metals, Core is looking at how it can evolve to service the shifting market. Established in 1981 Core Resources has built a reputation for delivering the highest quality process engineering and project management across a variety of project locations and minerals. From the metallurgical laboratory and workshop in Brisbane Core can carry out testwork, process design, project management and advisory work as well as developing new processing techniques to redefine mineral extraction. Executive Director Jonathan Loraine says for any resources project getting the process of metallurgy right is critical to success. The importance of metallurgy has increased as the complexity of ore bodies and the demand for cleaner extraction of minerals also rises; on top of this, the recent demand for high purity metals associated with energy storage can only be met through developing robust metallurgical processing solutions. Core Resources’ strength is in its ability to offer integrated metallurgical solutions that span from initial concept through to testwork, flowsheet design and process engineering, at all stages of project development. Crucially, the group has highly qualified staff across engineering, metallurgy and chemistry, many with extensive operational experience. Thanks to the metallurgical laboratory, Core can help a client first understand how an orebody might be processed, it can undertake test work like small scale pilots and it can then take the client through to the full pilot plant trial and feasibility study. “We also have our process design group which takes metallurgical test work, designs the process and gives the client a package they can take to an engineering company and have built,” Loraine explains. The changing climate for mineral processing, with tighter constraints and international treaties requiring cleaner products, has led to a period of rapid innovation for Core Resources. However, Loraine is not fazed. The new regulations and finding new ways to process new mineral development suit the company that has a track record for process innovation and providing solutions for new challenges. The Toowong Process, developed and patented by Core, is a key example of a processing technology that responds to the tighter environmental requirements of the mining industry – and creates new opportunities for miners in the process. Particularly targeting copper mine products, the Toowong Process is a technology which Core says ‘addresses the globally significant issue of arsenic, antimony and other deleterious elements in mine products’. The alkaline leaching process achieves over 90% arsenic and antimony removal from base metals concentrates. The final product from the process is a premium cleaned saleable concentrate. The increasing presence of arsenic in mine products is a major challenge facing copper producers, predominantly from the depletion of clean copper orebodies. Many new orebodies now have higher levels of deleterious elements like arsenic. These elements are transported across continents, as mines deliver their products to smelters which are often in high population or agricultural areas – the world’s arsenic can end up in the food chain of many of these populations. The Toowong Process allows arsenic to be fixed in an environmentally stable form for disposal right back at the original mine site, with no need to ship arsenic across the globe. The process has been extensively tested, culminating in a $4.5 million, 34-day pilot plant operation on concentrate from the Tampakan mine in the Philippines, successfully reducing the arsenic content from 1.1% to less than 0.1%. Loraine explains that there are three key drivers behind the demand for lower arsenic content spanning economics, regulatory constraints and social barriers. “It is simply getting more difficult to sell concentrates with arsenic in them and miners pay a higher penalty for trying to do so. It simply makes economic sense to find a cheaper way of dealing with those contaminants. “The other issue is that some mines won’t go ahead without a solution because they don’t want concentrate that is potentially so high in arsenic that they won’t find a buyer, that’s a regulatory hurdle. According to Loraine there has been a conscious shift towards sustainable mining practices across the industry as a whole. Even if companies could pay large penalties to have high arsenic concentrate treated somewhere, the clients Core Resources works with see social, economic and legislative imperatives in reducing arsenic content in its products as much as possible. Globally the mining industry is seeking to do a better job in the way that it handles and controls these kind of contaminants. 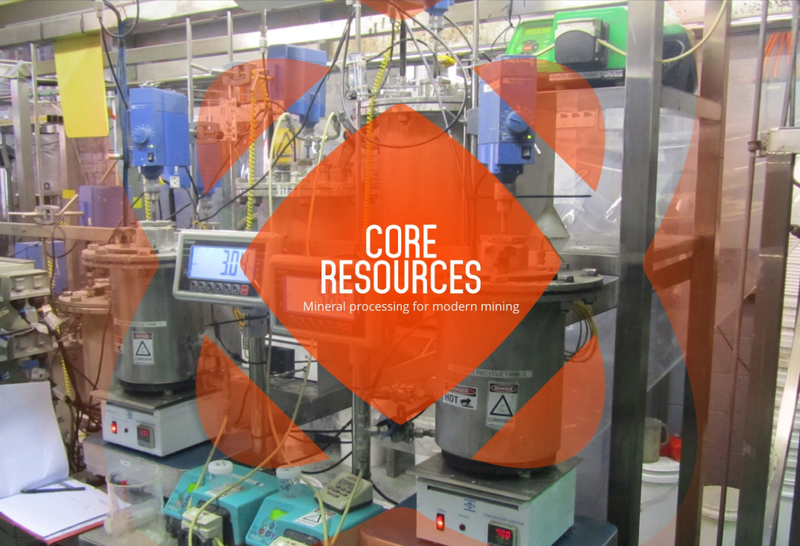 Having first tested the process with a mini pilot plant in 2011, Core Resources has seen three major demand pools for the technology. Primary clients in mining companies which have projects with high levels of arsenic in their orebodies, both undeveloped and operating mines; a second area of interest from smelters which buy concentrate and use the process as a way of treating and managing arsenic in a hygienic way; and a third group in trading companies which see an opportunity in buying high concentrate arsenic and cleaning it. Having come through the difficult period of the commodity price downturn in a stronger position, Core Resources is now in a position to build strong growth over the next cycle. In May, Core announced a strategic partnership with fellow minerals processing and extraction firm Mineral Technologies. The idea is for both companies to complement each other to provide end-to-end project solutions to precious and base metals customers. With Mineral Technologies operating as a world leader in fine mineral separation predominantly in coal and iron ore, the partnership will see both companies’ range of metallurgical and engineering services expand. “We are very much at the early phase of project delivery, doing the initial test work and design. We saw an opportunity to offer our clients a more integrated service, where we can offer equipment supply and project construction through our partner,” Loraine says. Loraine expects Core Resources to undergo a significant growth period through the next mining cycle and that will be consolidated by an increased focus in the market on the metallurgical processing of new energy metals. Core has been working on these metals over the last couple of decades – before they became known as energy metals – and is positioning itself to be a leader in this area. The work in base and precious metals will be expanded as the levels of activity and demand are returning to those seen before the downturn, and once the company has steadied itself through organic growth the next step will be to expand its technical services further. “I think the secret to success for the specialty metals will be the client’s ability to make specialised value-added products and the linkages with the market which will define long-term success.